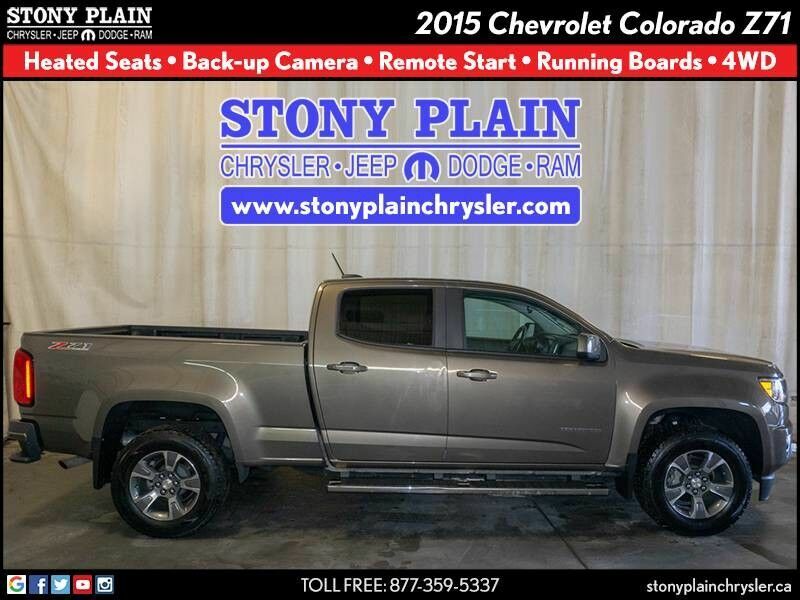 Stony Plain Chrysler is excited to offer this 2015 Chevrolet Colorado Z71 4WD pickup truck. The CARFAX report for this 2015 Chevrolet Colorado Z71 highlights that it's a One-Owner vehicle, and for good reason. A One-Owner vehicle gives you the feel of owning a new vehicle without paying the new car price. This 4WD-equipped vehicle will handle beautifully on any terrain and in any weather condition your may find yourself in. The benefits of driving a 4 wheel drive vehicle, such as this Chevrolet Colorado Z71, include superior acceleration, improved steering, and increased traction and stability. The Colorado Z71 has been lightly driven and there is little to no wear and tear on this vehicle. The care taken on this gently used vehicle is reflective of the 50,593km put on this Chevrolet. This pre-owned Chevrolet Colorado looks like new with a clean interior that's been well-kept. Marked by excellent quality and features with unmistakable refined leather/cloth interior that added value and class to the Chevrolet Colorado.